First Line: Reiner checked his watch has he waited by the elevator. It's 1999. contract killer Klaus Reiner has just been hired by two former French intelligence agents to eliminate an American businessman vacationing in southwestern France. Reiner specializes in murders that the police file away as accidents. He has no problem locating his target in a house outside the small village of Taziac, but things go pear-shaped when three innocent people are in the wrong place at the wrong time. These murders are assigned to Inspector Paul Mazarelle, formerly of Paris but now living in Taziac. His superiors fully expect him to bring his experience and successful record to bear on this quadruple homicide that's occurred at the height of tourist season. Enter Molly Reece, a New York City district attorney and the daughter of two of the victims. All the evidence points to a local Arab handyman, but after talking to him, Reece has doubts that he's the killer. So does Mazarelle, but Molly's knack of showing up in high profile locations and running her own investigation not only makes Mazarelle's job more difficult, it makes Reiner nervous enough to return to Taziac to ensure the police interpret the evidence the way he wants them to. Author Gerald Jay has taken the threads of the police procedural, the spy novel, and French charm and woven them into a vastly entertaining read. Mazarelle is a big bear of a man who smokes a special blend (Philosophe) of tobacco in his pipe, enjoys a midday cognac, and eats his favorite meals at the Café Valon. Although he believes he's not in the ranks of literary sleuths the like of Maigret or Poirot because his powers of intuition are much greater than his powers of observation, he is known as "the Swiss Army knife of detectives." One of the things he insists upon when given command of the investigation is the power of handpicking his detectives, and it's fascinating to see how he chooses them. During the selection, I felt as though there was one detective in particular that was a weak link, and it was interesting to see if my deduction was correct. Molly Reece adds a strong yet naïve element to the cast of characters, although her intelligence and intuition seems to fade in and out as the story progresses. Klaus Reiner is one of the more interesting villains I've become acquainted with recently, a chillingly attractive blend of ego, intelligence, and psychopathy. There are some excellent mystery series set in France-- especially those written by Cara Black, Fred Vargas, and Martin Walker. 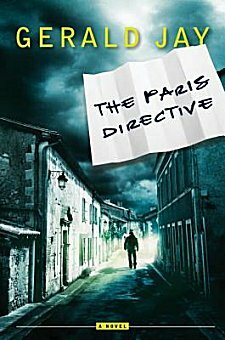 How does Gerald Jay's The Paris Directive compare? Very well indeed. I was quite happy to see that he's working on his second Inspector Mazarelle mystery. These talented writers are making France a regular stop in my crime fiction reading. Cathy - This does sound like a very nicely drawn police procedural. Normally I'm not one to be drawn to books featuring contract killers, but this one interests me. And it sounds as though the characters are fleshed-out and well-drawn too. They are, Margot, and I look forward to getting to know them even better. Your reviews get deeper and better every year. I enjoy them tremendously. I like the sound of this book, and I can just imagine an American D.A. not understanding the way investigations go in France, to say nothing of her personal attachment to two victims which would affect her judgement. Must read. I think you'd enjoy it, Barbara. Thanks for the kind words about my reviews.